Due to its tragic demise, the ancient Roman city of Pompeii was left in a remarkable state of preservation, and to this day it serves as one of the most significant archaeological sites in the world. From people immortalized in volcanic ash, to frescoes that would never have survived for so long if there wasn’t for their magma sarcophagus, Pompeii has provided scientists with unprecedented insight into the daily life of this historic civilization. 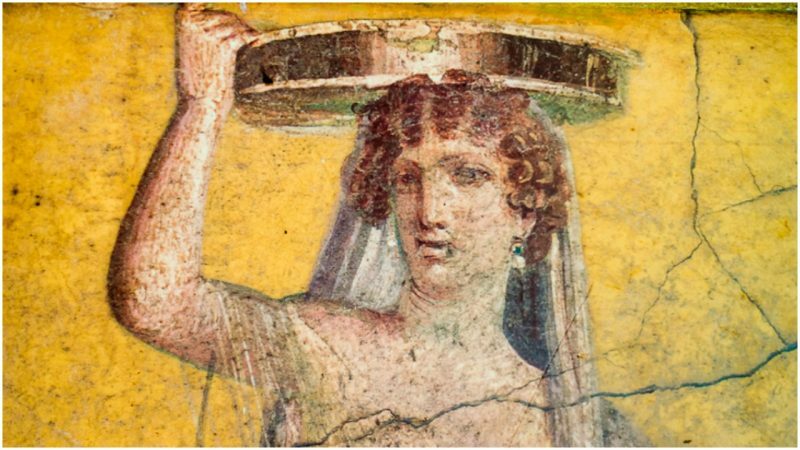 The recent unearthing of a “thermopolium” counter decorated with frescoes is already being hailed as a game-changer in the quest of re-enacting the cuisine and diet of ancient Romans who perished under the wrath of Vesuvius in 79 AD. 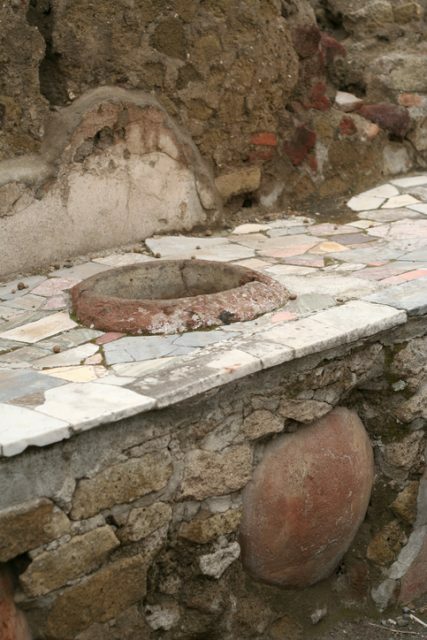 Thermopolium, dolias (jars) detail, of archaeological remains of the street Via Stabiana at Ruins of Pompeii. The city was an ancient Roman city destroyed by the volcano Vesuvius. Pompeii, Campania, Italy. 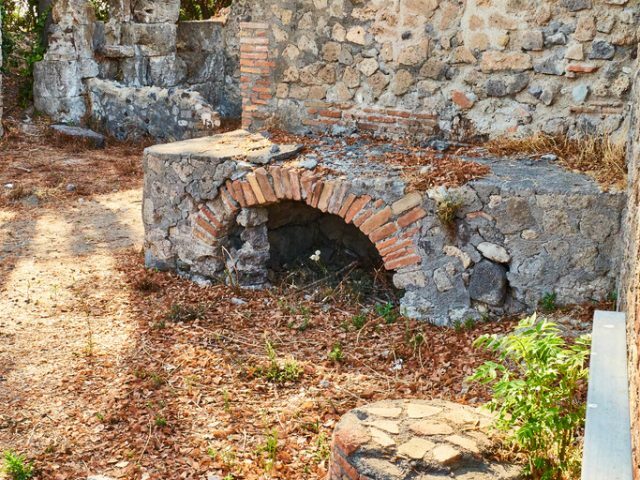 The counter of one such thermopolium was discovered in March 2019 in the sector designated Regio V, located to the north of the Pompeii archaeological site in an area not yet opened to the public. The news of the discovery first came via Instagram, where it was shared by Massimo Ossana, the superintendent of the site. 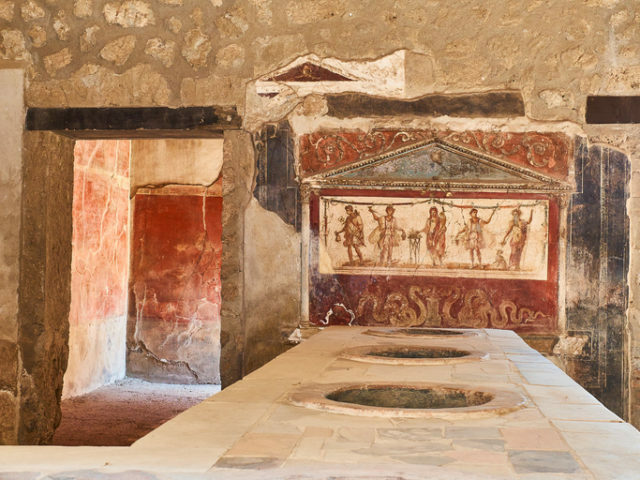 According to the Guardian, there were around 150 thermopolia fast food joints in the city of Pompeii, which served as a lifeline for the poor who often couldn’t afford to own a kitchen. Some 2,000 years ago, the daily menu included easy-to-make specialties like coarse bread with salty fish, baked cheese, lentils, and spicy wine. The counter is decorated with a fresco featuring earthenware jars, known as dolia, used to store foodstuffs such as dried meat. The fact that this thermopolium is adorned with a fresco implies that it was most probably owned by a well-off person, as such decorations were considered a luxury. Roman upper classes usually avoided and often scorned such places, considering them unworthy of their pedigree. Nevertheless, fast food restaurants like this one were all the rage in Pompeii, as well as other huge trading centers of the Old World. They were the vibrant social meeting places, and much like taverns, they were often the spots where business deals were closed. 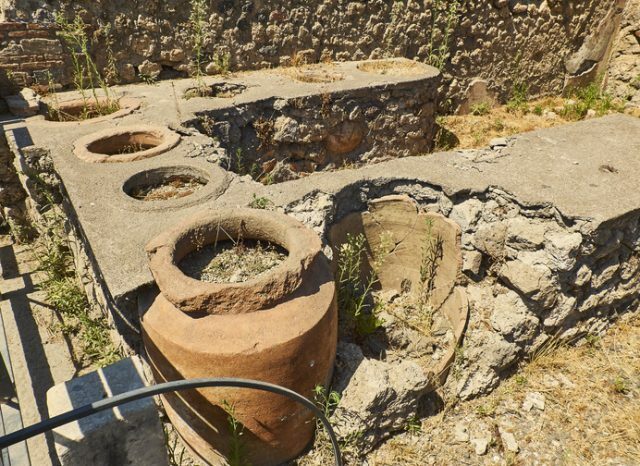 The discovery of the thermopolium counter comes in a series of recent excavations in the Pompeii archaeological park. In December 2018, well-preserved remnants of a horse with saddle were found in the park area, as well as another magnificent fresco that was unearthed in February 2019, in the remains of a villa. The fresco features Narcissus, the mythological hunter who became infatuated with his own reflection in a pool of water. Along with the fresco, human remains of two women and three children, all huddled together during the moments before their death. The discovery of this group of skeletons reminded us once again of the proportions of the tragedy that was the eruption of Vesuvius, which killed more than 2,000 people and left an ancient city forever frozen in time. Apart from Pompeii, the neighboring townships of Herculaneum, Stabiae, Oplontis, and Boscoreale also suffered greatly from the eruption which constitutes one of the worst known natural disasters of the ancient world.